I had a neighbour aunty who used to cook awesome food. She used to cook and distribute many dishes especially on festivals. I always waited for festivals to eat yummy food cooked by aunty. Aunty used to make lemon rice on almost all festivals and send boxes to her friends and neighbours. Relishing on aunties food was real feast for me. I always wanted to learn cooking south Indian dishes like her. When I started learning cooking I tried making lemon rice first. I wanted to make it like the way aunty made it. After some trials I could recreate the perfect lemon rice. This rice is mostly served with coconut chutney(or any choice of chutney ) and papads. Tangy taste of lemons makes this rice different in taste. Peanuts and lentils(Chana dal and urad dal) are added in rice to give nutty taste. I add more cashews and peanuts while making this rice as my kids like rice with more nuts. 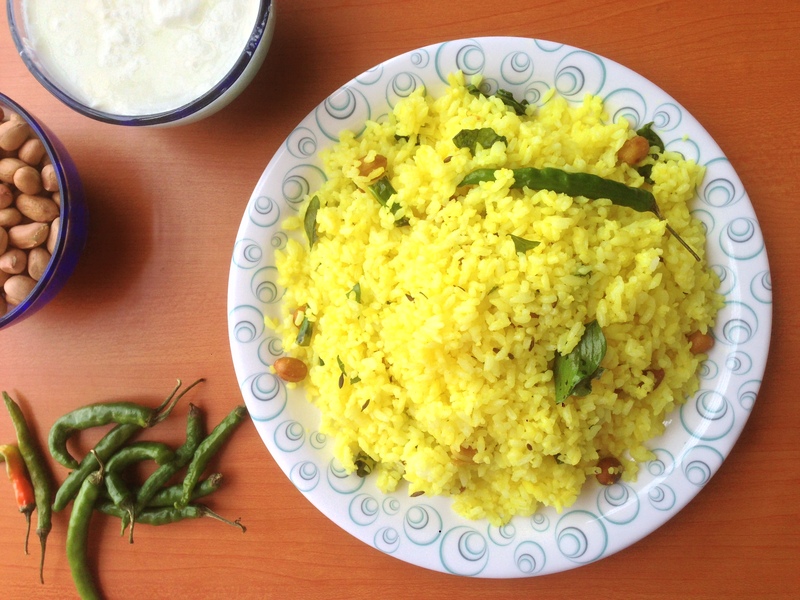 Lemon rice can be made using freshly cooked rice or leftover rice also. It tastes well and more aromatic when cooked using freshly cooked rice. Please try following recipe and let us know about it in comments section. Wash and Cook 2 cup rice with 4 cups water and salt in open vessel. Add 4-5 drops of oil in it while cooking.By cooking rice in this way makes it non sticky. Remove rice from flame before it gets completely cooked and spread it in one plate for cooling. Squeeze lemons in bowl and remove seeds from it. Keep squeezed lemon juice aside. Roast urad dal with some oil in kadhai.Keep it aside. Roast chana dal ,peanuts separately with some oil similarly and keep them aside. Heat pan and pour oil in it . Once oil gets hot add cumin and mustard seeds , pinch of asafoetida in it. As seeds crackle add red chilies and curry leaves in oil. Add roasted dals/lentils and peanuts in pan and saute for a minute. Add 1/4 tea spoon of turmeric powder in pan. Add lemon juice and cooked rice in pan and saute for 2 minutes . Adjust salt as per taste and cook rice for 5 more minutes. Switch off gas and keep lemon rice covered for few minutes before serving. Serve lemon rice with papad and chutney.